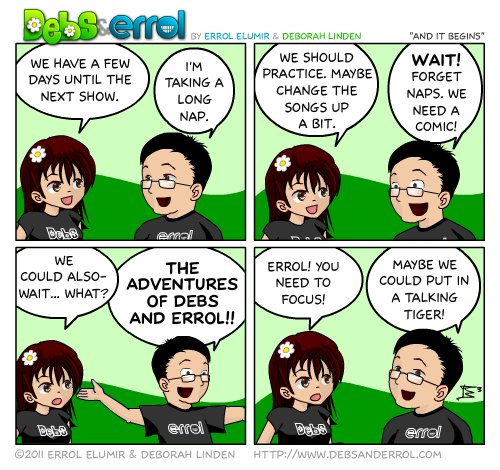 Errol: If you want to know what is true and what is not, “Errol, you need to focus” is a common phrase that I hear from Debs. Debs: Yeah that’s true, but that’s mostly because you have 500 ideas a day and we can’t follow through on all of them! ← CD Update! Double Rainbows for Real! Man, I read this, and I think “Talking tigers! Just like in Captain Marvel!” Then I get down to the comments section and Deej has beaten me to it. Drat. I was thinking Tony the Tiger! You guys are such geeks. Errol, I want to know if you could draw an albino and a transvestite? Doesn’t have to be in the comic (although it would be cool) but I am curious what you would come up with for drawings. *laugh* You should start your own comic, Michael! I don’t know if I could draw that! I’m very lazy in my comics… because I have to spit them out every day… so there is a lot of cutting and pasting.